China I used it in CNC milling machine. We were able to process with AL plate F100. This review is about item#40167942. It cuts aluminum A5052, A2017 at 2 x 12, but it can be easily cut without breaking. T10 was also able to be processed, but because the blade length is short, some measures are necessary for removing the facet. This review is about item#40167967. Aluminum, acrylic, iron (SS400) etc. We have processed it, but it can be used without problems. I have not seen anything of such quality in this price range, so I was saved. Thank you very much. Moreover, it is a little disappointing that the shank diameter is 4 mm. I hope not only 4mm but also 3mm etc. We have made four stars including that point. This review is about item#40167976. Although it was a long neck end mill, it was in the end mill case for normal use. It was an end mill case that was shorter than the full length of the long neck end mill. The one of MRE 1 x 12 was in a long case for long neck end mill. 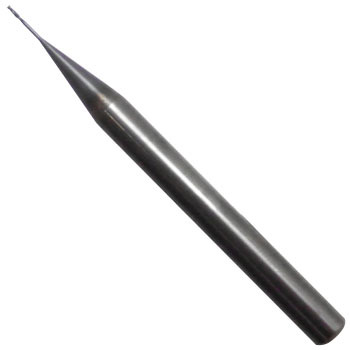 Although the cover of the end mill blade was a soft cover, in the case of a long neck or an ultra fine end mill, I want a hard cover to be used. Because of that, I feel the part of the neck is bent. I do not know whether the accuracy is low due to inappropriate cases. Although the blade diameter is 0.5 mm, it feels like 0.6 mm when drilled. I tried it with CNC machine · Proxon router · drill stand dedicated to making printed circuit board. Please send the case of the end mill in the appropriate case dedicated so that it is thinner as it is thinner. Please refer to the case of Nisshin Tool for the end mill case. Please also refer to the case of Toyo Associates for the rotary bar. The case of Nisshin Tool is 4mm shank diameter · The case of Toyo Associates is best for shank diameter 3mm. The shank diameter of 2.35 mm for the router drill is good for Kiso Power Tool · Proxon. Since I have never bought shank diameter 6 mm or more, I do not know the appropriate case (reference manufacturer). Make a plastic gear with a module of 0.5 or more. Because of the thinness of 0.5 mm, it folds well, but it is not during processing, but there are many inadvertent in the process of removing the processed item, so if this is to be managed somehow, since the processing material is primarily resin, dissatisfied with the product there is no. Strongly speaking, in addition, if it is about 5 mm afterwards, we can feel more secure. This review is about item#40167933.